THE PHOTOGRAPHER at the centre of the controversy between Conor McGregor and Paulie Malignaggi has broken his silence. On Thursday evening, former WBA welterweight champion Malignaggi revealed he would no longer be helping McGregor prepare for his August 26 boxing match with Floyd Mayweather. Malignaggi decided to end his stint with Team McGregor after a series of photographs appeared to show the UFC lightweight champion, who has no professional boxing experience of his name, getting the better of the thirty-six-year-old. In a statement on Twitter, a frustrated Malignaggi said: "I wanted to clear the air. I am leaving the McGregor training camp today. I came with best intentions & intended to help out. "Just the chance to be part of such a big event in this capacity excited me. I believe Conor and I have a mutual respect inside the ring, (learned) from each other with some good work over 2 sparring sessions. It's some of the stuff outside the ring and some ways some things were handled in training camp that I didn't agree with that made me come to this decision. "It's not my place to dictate terms in a training camp that is not mine, but it's my place to decide if I want to be part of it. I will not give away anything tactical that I saw in 2 sparring sessions with Conor. For what it's worth, they have my word. "The things that upset me though I will speak about in time. I wish McGregor well in the rest of their preparations and look forward to being back in Vegas to work fight week on Showtime." 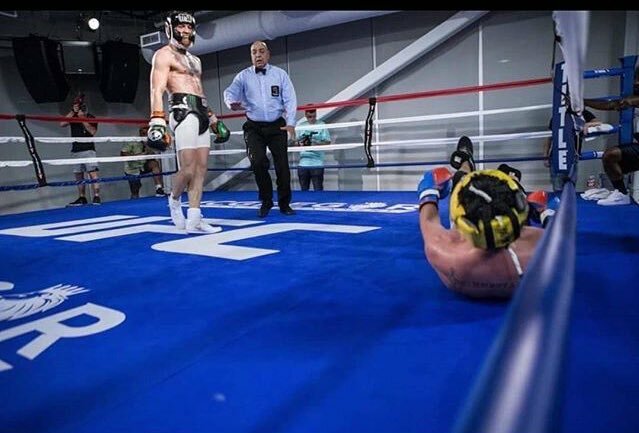 The photo which Malignaggi took great exception to was a snap which appeared to show the aftermath of McGregor knocking down 'The Magic Man' - who claimed it was nothing more than McGregor pushing him down. The man behind the lens that day was The Mac Life's Dave Fogarty, who regularly documents Ireland's first UFC champion's training camps. And according to him, the alleged knockdown wasn't a setup. Fogarty tweeted the picture with the accompanying caption: 'There no conspiracy, there [was] no photoshop just pure unadulterated power."